This is my most recent completion, and was 17 years in the making. The design I found in a magazine in 1996. I started stitching in 2010. Yes I kept the pattern for fourteen years, and umpteen moves, knowing I'd get there eventually. I started two months before my eldest son was born, stopped when he was born, started again when I went back to work in March 2011, sewing evenings and lunch hours until I finished it in September, put it somewhere safe, and promptly lost it. The pattern is called Linen Lands, by Sue Cook, for the magazine Cross Stitch Treasury. The magazine itself lasted only two issues I think, and this was in the first issue. Sewn on 28 count antique white linen Its got some lovely details. 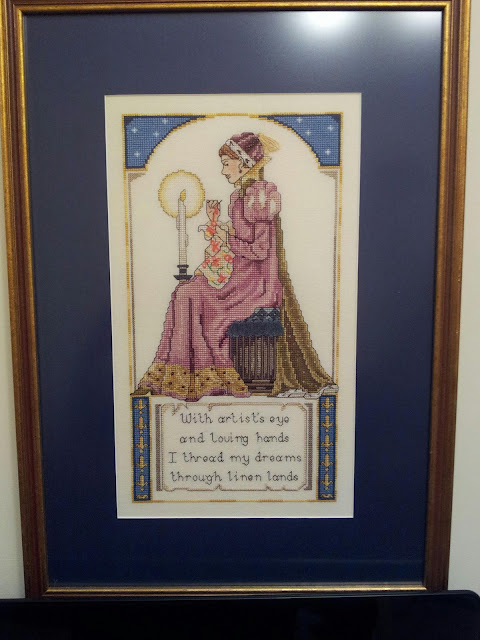 The face and hands are worked in half cross stitch over 1 thread, so look really delicate. It has beads, blending filament and gold braid worked into it. The stool is worked using long stitch for contrasting texture, and the tassells and a bit of dimension. It was nice to do a bit more than cross stitch.